January is the saddest month. I feel bad for it sometimes - it didn’t choose to be a winter month and one that nearly everyone detests. A month with just as many days as its previous much revered forerunner. Standing in the shadow of December is a plight none of the other months have to endure. Even February knew to do the right thing by shortening its days - almost in a - ‘see, I at least did the right thing‘ way. For some, though, January is a month of change - terms such as whole 30, detox and veganuary come to mind. Motivation galore to strip away all of the previous year’s doings and start fresh. However, none of the terms apply to me. 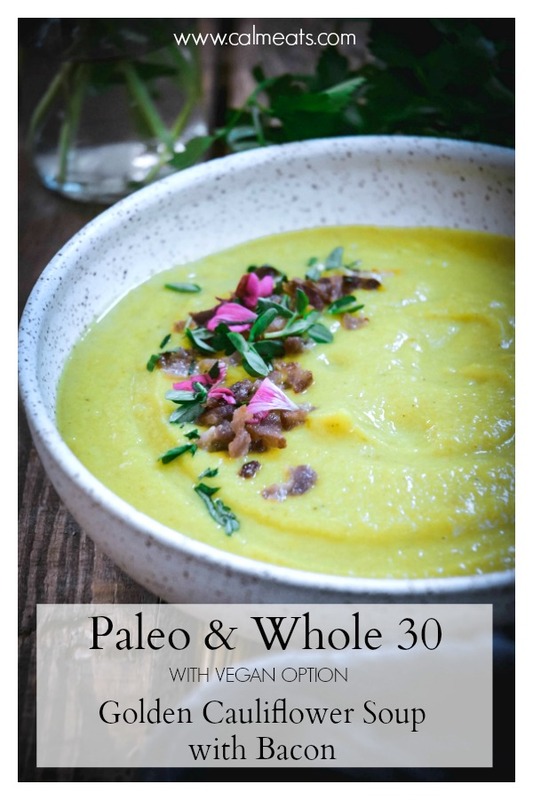 I don’t do detoxes, I’m not vegan and whole 30 is not for me even though most of the food on this blog is. I like wine and chocolate too much after all. But despite being a much disliked month, January brings silence and contemplation. Just think back on all of December’s obligations - parties, presents, travel. January expects none of that. It allows me to just be for a while. Its bitter cold temperatures and the occasional snow are a perfectly good excuse to not over-commit. 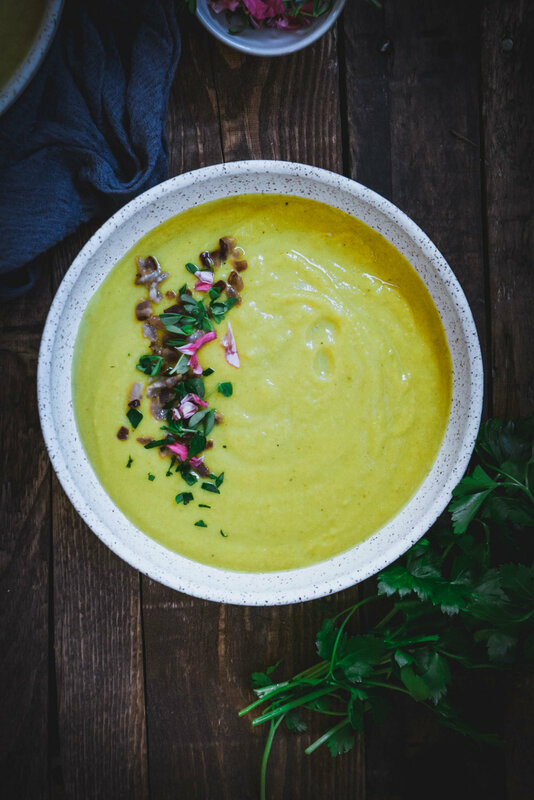 So as we’re getting close to the end of it, I would like to thank it for its service and dedicate this golden cauliflower soup to it. 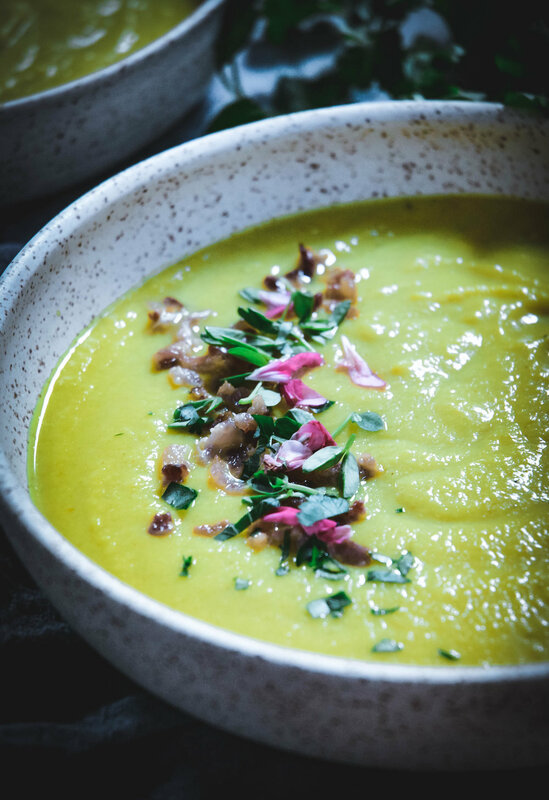 It feels only right that a soup this warm and creamy be had during January. I mean, of course it’s perfectly acceptable any other time but to me it just feels appropriate now. 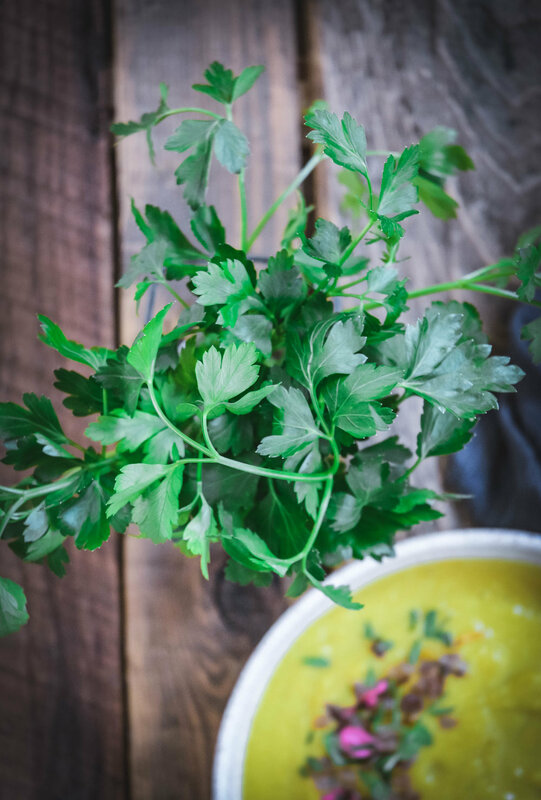 After all, using seasonal ingredients is one way to at least partly come to accept winter. 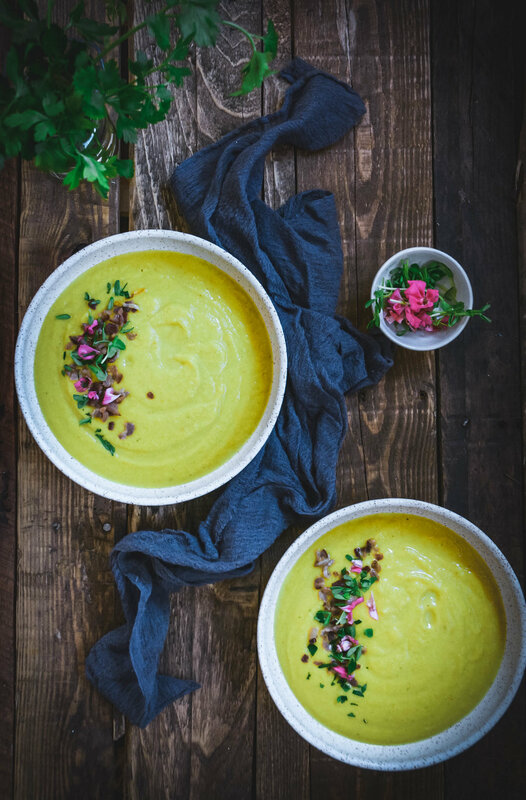 And as leeks reach their peak in January, they’re going to be the base for this velvety, smooth cauliflower soup full of spices and topped with crispy bacon. But if you do follow a vegan lifestyle, it’s perfectly fine to skip the bacon entirely. Preheat soup pot on medium heat. Add bacon and cook for 5 minutes until crispy. (If vegan, skip this step and use 1 tbsp oil of you choice and move on to next step). Remove bacon when cooked and lay on paper towel lined plate. In same pan, add sliced leek and a good pinch of salt. Cook until leek has softened - about 5 minutes. If you need additional oil, you can always add a bit more. Add cauliflower florets and potato and mix well and cook for another 5 minutes. Add spices, ginger, salt and pepper and toss to cook for 30 seconds to let spices release their flavor. Add broth and coconut milk and bring to a boil. Reduce heat and let soup simmer for 25 minutes until vegetables are fork tender. Next, carefully add the vegetables to the blender reserving the liquid and adding a bit at a time as you blend, until you reach desired creaminess. Adjust seasonings if you need more salt. Serve with reserved bacon bits and chopped parsley.